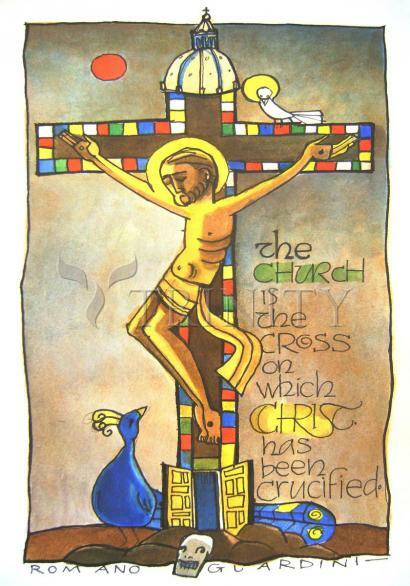 The Church is the Cross on which Christ has been Crucified. Romano Guardini was born on February 17, 1885, in Verona. His father was an importer of eggs and poultry. When Romano was one year old, the family moved to Mainz, Germany, a city whose origins go back to early Roman times. His childhood was an unhappy one. His mother kept the children virtually captive in their home. His youth was a time of inner tumult, uncertainty about his vocation and painful attacks of depression. In 1903 Guardini graduated from the gymnasium in Mainz and began the study of chemistry at the University of Tubingen. Depressed, he left the university after two semesters and in 1904 enrolled at the University of Munich for the study of economics. In 1905, he had a deep crisis of faith from which he emerged with the decision to study theology at Freiburg in Breisgau. But depression again took hold, to such a degree that he considered suicide. Still, he stuck to his decision, and from then on he knew that the priesthood was his only and true vocation. He continued his theological studies in Tubingen and during that time he had his first exposure to true liturgy at the Abbey of Beuron, whose monks were early pioneers of liturgical renewal. Liturgy from then on became a lifelong interest. In 1910, he was ordained. The next 13 years he served as associate pastor in Heppenheim, Darmstadt, Worms and Mainz. During this period he continued his studies at Freiburg and received his doctorate in theology with a dissertation on the teaching of St. Bonaventure on salvation. From 1916 to 1918 Guardini served in the military as a hospital orderly, but also directed Juventus, a Catholic organization of students of higher education.